Did you ever think that you could buy your car tyres online here in India? May be you have. But I bet, you may have never imagined that you will be able make an online purchase of door-step installation of those car tyres. That’s exactly what Snapdeal has come up with – For the first time ever in India, an eCommerce site will offer you purchase and door step installation of car tyres of all the leading brands. Snapdeal.com has listed Tyres from leading manufacturers like Apollo, MRF, Michelin, Bridgestone and Yokohoma on their eCommerce portal. The door step installation is available anywhere in India and once a customer makes a purchase, experts will come to your home and fit it to your car. As an added advantage, Snapdeal is offering 1 year road assistance and free wheel balancing for tyre purchases on their site. The collection of tyres is pretty big as well – they have nearly 3000 different tyres and close to 50 alloys for customers to choose from. The price ranges from Rs. 2000 to Rs. 1,10,000. The tyres come for various car makes and models and has all types of Tyre RIMs, Profiles, Widths and brands. The offerings are probably much higher than any offline tyre showroom you may have seen. To get the tyres installed at your door step is simple. Once you buy the product from Snapdeal, it will be delivered to your location. Interestingly, next day shipping is available for many cities as well. Once the tyres arrive at your home, you will need to call Snapdeal’s installation experts on 011-47090901and provide them with your order number. You can then let them know the desired location and time for the fitment of tyres to your car. Undoubtedly, this is a great offering from Snapdeal. 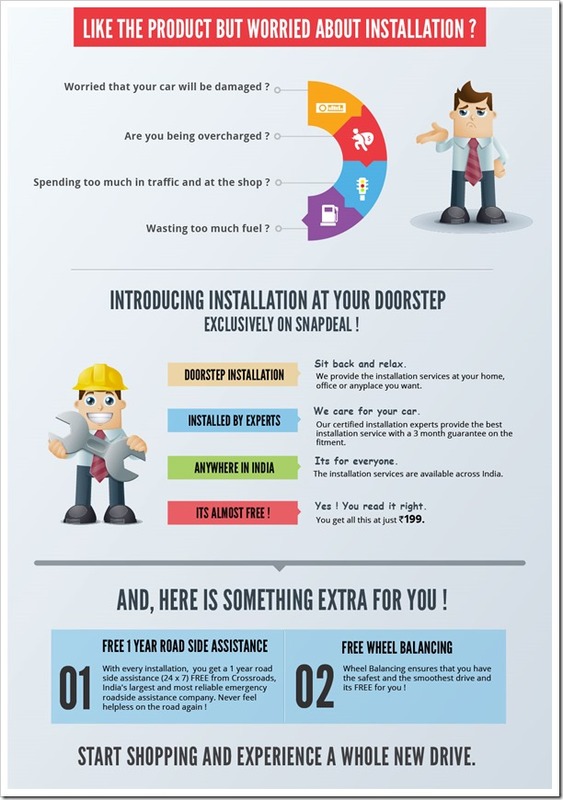 While tyre purchases may have been available earlier, Snapdeal has raised the bar by offering free door-step installation services. This is sure to be a boon for working professionals who are always short on time. On the other hand, it will be interesting to see how many will actually make the purchases on tyres online. Generally, a car owner is dependent on his mechanic to suggest him a good tyre. Also, many people prefer to touch and feel before they make purchases. People who have good knowledge about various tyre types and brands may be more inclined to make purchases online. A lot will also depend on the cost benefit of buying tyres online. While Snapdeal is offering around 20 percent discount, it will all boil down to how their pricing compared to offline tyre shops. If you are a tyre expert, do let us know about this offering from Snapdeal.